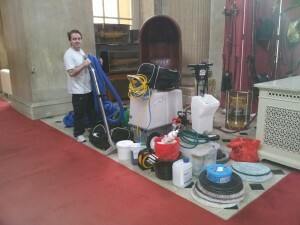 Commercial carpet cleaning Oxford at its best! 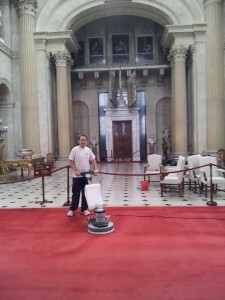 Well, for the fourth year running we have had the privilege of doing the carpet and upholstery cleaning at Blenheim Palace, Woodstock. It has taken 2 weeks and a lot of hard work but we got there in the end! 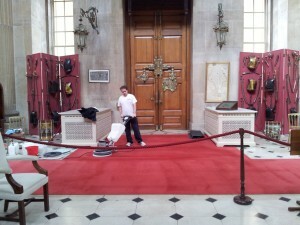 Management were very pleased and we had some great remarks on how brilliant it all looked. Big test for our new machine too!!! 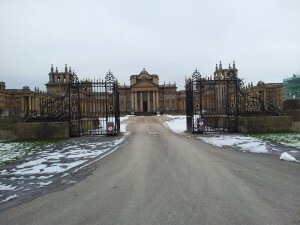 Our new and amazing portable carpet cleaning extractor was christened at Blenheim and it coped amazingly well helping us to fly through the 4 miles of carpet. Having pump in and pump out saved so much time! It was so satisfying to see such filthy water coming out and to make the carpets clean and fresh once again. Here is Richard using a bonneting system on the entrance area after having already used hot water extraction processes – this is where hundreds of people flood in every day and so it was extra filthy and required some additional attention. And here is Richard again, job complete and very worn out!! 😉 Only got to carry all of this equipment down to the van now! 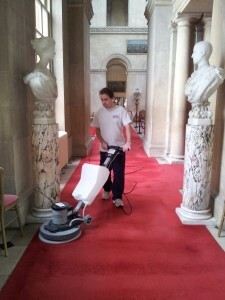 Use the best and contact us for your commercial carpet cleaning in Oxford – References available upon request.